A Case for Adopting Best of Breed: 7 ways AEC companies can drive innovation. 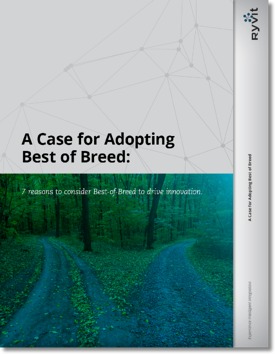 7 reasons to consider Best of Breed to drive innovation. At Ryvit, we hold a firm belief in the power of focus enabling innovation. What do we mean by that? We mean that helping each individual in the company perform their job in a way that is as efficient, effective, and mature as possible using specialized and focused tools to help them do that. The challenge with innovation is generally two-fold. The resulting organizational changes needed to support a “new way” of doing things, and the potential data silos that are created when specific solutions are installed, but not setup in a way that provides a connected and integration application experience. 1. First: What is Best of Breed Software? 2. Ever hear the phrase, happy employees make happy customers? 3. Up front investment of time and money is minimal and streamlined. 5. Huge ROI, Rapid Payback, Time Savings! 6. Cloud Computing is a powerful thing. 7. Don’t Forget the Data + Don’t Ignore the Objections.